The Bacillus subtilis glucokinase operon was predicted to be comprised of the genes, yqgP (now named gluP), yqgQ, and glcK. We have previously established a role for glcK in glucose metabolism. In the absence of enzymes that phosphorylate glucose, such as GlcK and/or enzyme IIGlc, accumulated cytoplasmic glucose can be transported out of the cell. Genes within the glucokinase operon were not previously known to play a role in glucose transport. Here we describe the expression of gluP and its function in glucose transport. We found that transcription of the glucokinase operon was regulated, putatively, by two promoters: σA and σH. Putative σA and σH-recognition sites were located upstream of and within gluP, respectively. Transcriptional glucokinase operon – lacZ fusions and Northern blotting were used to analyze the expression of gluP. GluP was predicted to be an integral membrane protein. Moreover, the prediction of GluP structure revealed interesting signatures: a rhomboid domain and two tetracopeptide repeat (TPR) motifs. Microscopic analysis showed that GluP minus cells were unable to divide completely, resulting in a filamentous phenotype. The cells were grown in either rich or minimal medium. We found GluP may be involved in glucose transport. [14C]-glucose uptake by the GluP minus strain was slightly less than in the wild type. On the other hand, trehalose-derived glucose in the growth medium of the GluP minus strain was detected in very low amounts. Experimental controls comprised of single or multiple genes mutations within the glucose transporting phosphotransferase system. gluP seems to be regulated only by a putative σA-dependent promoter. The glucose uptake and export assays suggest that GluP is important for glucose export and may act as an exporter. This also supports the role of the glucokinase operon in glucose utilization. Bacteria can utilize a variety of sugars for growth. However, glucose, which is one of the most ubiquitous monosaccharides, is used preferentially as a carbon source . Depending upon the physiological state of the cells, assimilated glucose is utilized for cell division, converted into storage compounds, or used for the production of secondary metabolites. Bacteria may exploit glucose availability ranging from sub-micromolar to millimolar concentrations, by developing and dedicating several transporters composed of multiple protein subunits [2, 3]. For example, Escherichia coli is known to possess at least seven transporters capable of acquiring glucose and may have additional transporters that have not yet been identified . Bacteria, such as Bacillus subtilis, utilize glucose via at least two discrete pathways. The first pathway is the phosphoenolpyruvate-dependent (PEP) phosphotransferase system (PTS) [5, 6]. The PTS comprises enzymes such as enzyme I (EI), enzyme II (EII), and histidine-containing phosphocarrier protein of the PTS (HPr). Enzyme II phosphorylates glucose into glucose 6-phosphate upon uptake . In contrast, the phosphorylation will not occur in non-PTS transported glucose. The key molecule involved in the non-PTS pathway is a glucose:H+ symporter (GlcP) . Consequently, phosphorylation of glucose is carried out by a cytoplasmic enzyme glucose kinase/glucokinase. B. subtilis glucokinase (GlcK) has been elucidated by us, and is found within the glucokinase operon [8–10]. The operon was predicted to consist of the genes, yqgP, yqgQ, and glcK, respectively . In contrast to glcK, the function of other genes belonging to the operon are not known. Here we report, for the first time, the expression of the upstream gene within the B. subtilis glucokinase operon, yqgP. Structural prediction of YqgP protein and the role of the protein in glucose transport are also discussed. Based on our findings, described below, we have now named YqgP protein as the glucose transporter protein or GluP. By examination of the gluP's upstream sequence, we have identified a consensus promoter sequence, TAGGCG(N)17TTATAA, recognized by σA as proposed by Kunst et al. [11, 12] and Skarlatos and Dahl . In addition to that, we have found a sequence, GAAGGAAAG(N)12ACAGAATTG, within gluP, which would fall into a recently described signature of the σH binding site (RXAGGAWWW(N)11–12RXXGAATWW) . Based on these findings, we constructed several transcriptional glucokinase operon – lacZ fusions. The lacZ was placed downstream of the constructs replacing glcK. We examined the transcription of the glucokinase operon – lacZ fusion during exponential (T-2), transition (T0), and stationary (T2) phase. B. subtilis MD195 harboring a vector containing lacZ only, served as a negative control (Fig. 1A). 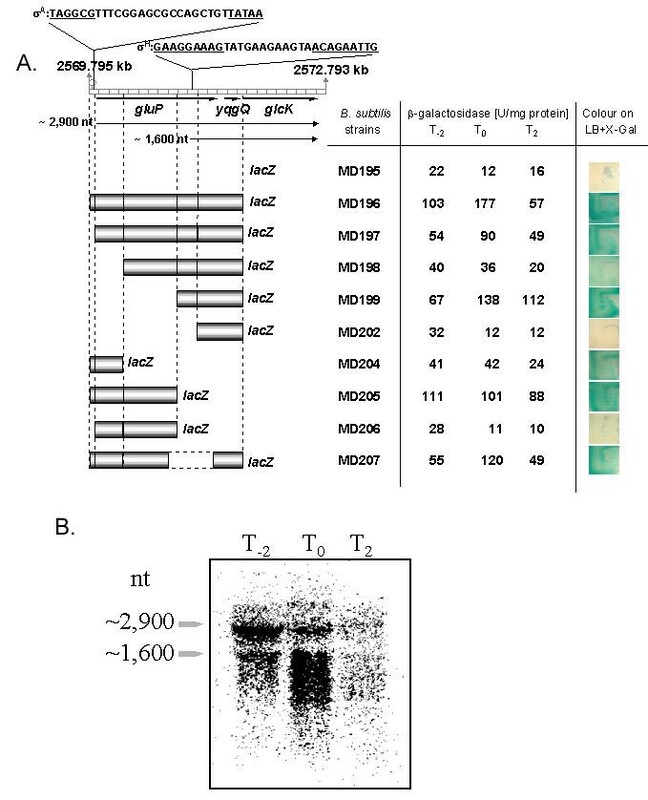 Cells carrying glucokinase operon – lacZ fusion lacking both putative σA and σH recognition sequences (B. subtilis MD202 and MD206) displayed similar β-galactosidase activities to B. subtilis MD195, suggesting that the corresponding operon fragment was not transcribed (Fig. 1A). In contrast, cells carrying either the putative σA-(B. subtilis MD204, MD205, and MD207) or σH-(B. subtilis MD197, MD198, and MD199) recognition sequences alone, or both (B. subtilis MD196), were able to transcribe the corresponding operon fragment, resulting in bluish-green colonies on LB agar medium supplemented with X-Gal (Fig. 1A). Based on these transcriptional glucokinase operon fragment – lacZ fusions, our results clearly indicated that there were two putative promoters, which were located upstream of and within gluP, respectively. Together with yqgQ and glcK, gluP expression is likely under the control of a putative σA-dependent promoter. Meanwhile, a putative σH-dependent promoter may control only the expression of yqgQ and glcK. Transcription of B. subtilis glucokinase operon. (A) Glucokinase operon is located between chromosomal 2569.795 and 2572.793 kb, as is available in the SubtiList database . β-galactosidase assays of the transcriptional glucokinase operon – lacZ fusions were determined quantitatively as described in materials and methods. Average value of β-galactosidase activity (U/mg protein) is presented from two independent experiments. β-galactosidase activity (bluish green colour) was also monitored in vivo using LB plates containing X-Gal. (B) Northern blot of glucokinase transcript with a probe localized within glcK. B. subtilis MD196 containing both σA and σH putative binding sites within the glucokinase operon fragment – lacZ fusion displayed higher β-galactosidase activity in the T0 than in the T-2 and the T2. This data suggests that the operon's peak transcription occurs during T0 (Fig. 1A). However, cells carrying only the putative σH-dependent promoter region and yqgQ (B. subtilis MD199) displayed higher β-galactosidase activity during T0 and T2 than during T-2. This indicates that the putative σH had higher activity in T0. 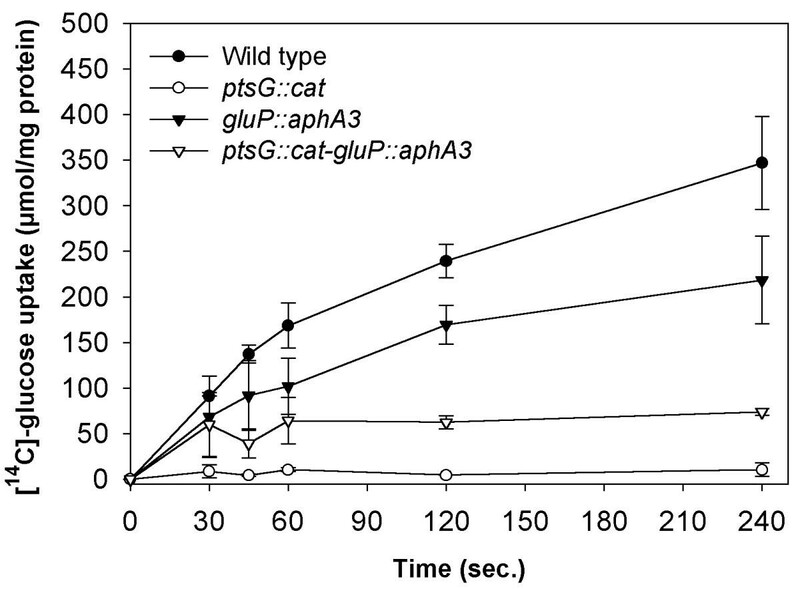 On the contrary, cells carrying only the putative σA-dependent promoter region and gluP fragment, without the σH recognition site, (B. subtilis MD205) had much higher β-galactosidase activity than the negative control (B. subtilis MD195) in all growth phases. We further verified the glucokinase operon transcripts with Northern blot analysis. An amplified 449-bp DNA fragment from glcK was used as a probe and labeled. This analysis showed two bands with sizes of approximately 2900- and 1600-nt, suggesting that two mRNA products were transcribed from the glucokinase operon (Fig. 1B). The band sizes, 2900- and 1600-nt, were in agreement with the distance between the putative σA-dependent promoter and the glcK stop codon (2878 bp) and between the putative σH-dependent promoter and the glcK stop codon (1616 bp), respectively. Interestingly, the 2900 nt band was intense at T-2 and gradually diminished as the cells shifted to the subsequent growth phases. In contrast, the 1600 nt band was initially fairly small at T-2 and peaked at T0. This result indicates that there was a work-shift between the putative σA and σH. All genes within the glucokinase operon seemed to be transcribed during the exponential phase. When cells entered the transition phase, yqgQ and glcK were more abundantly transcribed than gluP. So far, it seems that σA is the principal sigma factor present in vegetatively growing B. subtilis, while σH is essential for the early stages of sporulation . Taken together, expression of the transcriptional glucokinase operon – lacZ fusions and Northern blot analysis demonstrated that there were two putative promoters regulating the transcription of glucokinase operon. gluP (1521 bp) encodes a 56 kDa protein (GluP) comprising of 507 amino acid residues. We searched the Prosite database of protein families and domains http://ca.expasy.org/prosite/, as well as the protein families database of alignments and HMMs (pfam) http://www.sanger.ac.uk/Software/Pfam/ to find GluP domain architectures. It seems that GluP may contain very interesting signatures. These are the rhomboid domain and tetracopeptide repeat (TPR) motif. The rhomboid domain belongs to a family of integral membrane proteins . Similar to the other rhomboid family members, GluP may contain three strongly conserved histidines at position 232, 237, and 339 (Fig. 2A). In addition, GluP may also consist of a conserved serine at position 288 (Fig. 2A). This Ser-288 is part of a serine protease motif [17, 18]. We further checked for the potential transmembrane domain of GluP employing the TMHMM2.0 http://www.cbs.dtu.dk/services/TMHMM/ and SOSUI http://sosui.proteome.bio.tuat.ac.jp/sosuiframe0.html programs. GluP consists of six putative membrane-spanning segments, suggesting that GluP is likely an integral membrane protein (Fig. 2B). Bacterial and archaeal members of the rhomboid family contain six transmembrane helices (TMHs), whereas the eukaryotic members typically have an additional seventh TMH . GluP is predicted to have a rhomboid domain, which is located within transmembrane helices. (A) Multiple alignments of GluP and other rhomboid proteins. (B) Predicted 2-D structure of GluP (SOSUI program ). Arrowheads are conserved histidine residue. Predicted conserved Ser-288 of serine protease motif is indicated with asterisk. The second signature, a TPR motif, is a degenerate 34 amino acid sequence that is often arranged in tandem arrays, along with eight conserved consensus residues at position 4(W/L/Y), 7(L/I/M), 8(G/A/S), 11(Y/L/F), 20(A/S/E), 24(F/Y/L), 27(A/S/L), and 32(P/K/E) [22–24]. GluP was predicted to have two TPR motifs, which are positioned at amino acid residues 424–457 and 458–491 (Fig. 3). 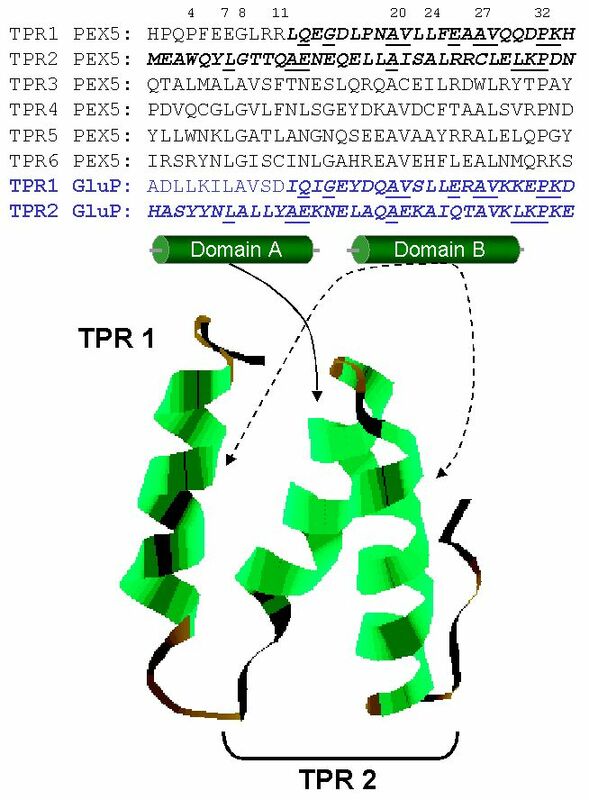 The prediction of the TPR motif's secondary structure revealed two α-helical domains, named A and B (Fig. 3). The Geno3D program was used http://geno3d-pbil.ibcp.fr/cgi-bin/geno3d_automat.pl?page=/GENO3D/geno3d_home.html to predict the three-dimensional structure of the protein, based on available crystallized proteins. Geno3D found human PEX5 TPR motifs , especially the TPR1 and TPR2 motifs, to be a strong template for deducting GluP TPR tertiary structure (Fig. 3). Geno3D recognized three helical turns representing domain B of TPR1 and domains A and B of TPR2 (Fig 3). Domain A of the GluP TPR1 could not be distinguished due to lower identities to the template. No available crystallized proteins could be used as a structural template for the GluP rhomboid domain. Human protein PEX5  based deduction of three-dimensional structure of GluP TPR motif (Geno3D program ). Amino acid residues that were used to build the GluP TPR structure are italicized. The conserved residues are underlined. A protein containing combined rhomboid domain – TPR motifs seemed rare. BLAST searching  showed that, besides GluP, there were seven other rhomboid-TPR proteins found in Gram-positive bacteria. Their sequences can be accessed from GenBank with the IDs NP_242287 (B. halodurans), NP_692844 (Oceanobacillus iheyensis), NP_464862 (Listeria monocytogenes), NP_470710 (L. innocua), NP_646318 (Staphylococcus aureus), NP_764790 (S. epidermidis), and ZP_00060595 (Clostridium thermocellum). With respect to GluP, their amino acid identities are 33.1%, 29.6%, 26.8%, 27.0%, 17.9%, 18.9%, and 26.8%, respectively. GluP minus cells were still able to sporulate (Fig 4). However, the sporulation frequency was two-fold lower (33 %) than the wild type's. Microscopic analysis showed that GluP minus cells were defective in their ability to separate during cell division, resulting in a filamentous phenotype. The GluP minus cells were grown in either rich or minimal medium (Fig. 4). We then visualized the DNA chromosome and the cell membrane of GluP minus cells with bisbenzimide and FM5-95 dye, respectively. Bisbenzimide would generate blue fluorescence of the chromosomal DNA and FM5-95 dye would produce red fluorescence of the cell membrane when visualized using the proper filter lenses (Fig. 5). Every GluP minus cell still contained chromosomal DNA, although in a filamentous phenotype (Fig. 5A). Wild type cells used as a comparison are shown in Fig. 5B. Taken together, the decrease in the GluP minus strain's ability to sporulate may be due to the inability of the cells to divide completely and normally. This may indicate a role for GluP in cell division. The contribution of the rhomboid domain and/or the two TPR motifs to the failure of the GluP minus strain to divide normally warrants further studies. GluP minus cells (1) phenotype as shown by phase contrast microscopy, in comparison with the wild type cells (2). 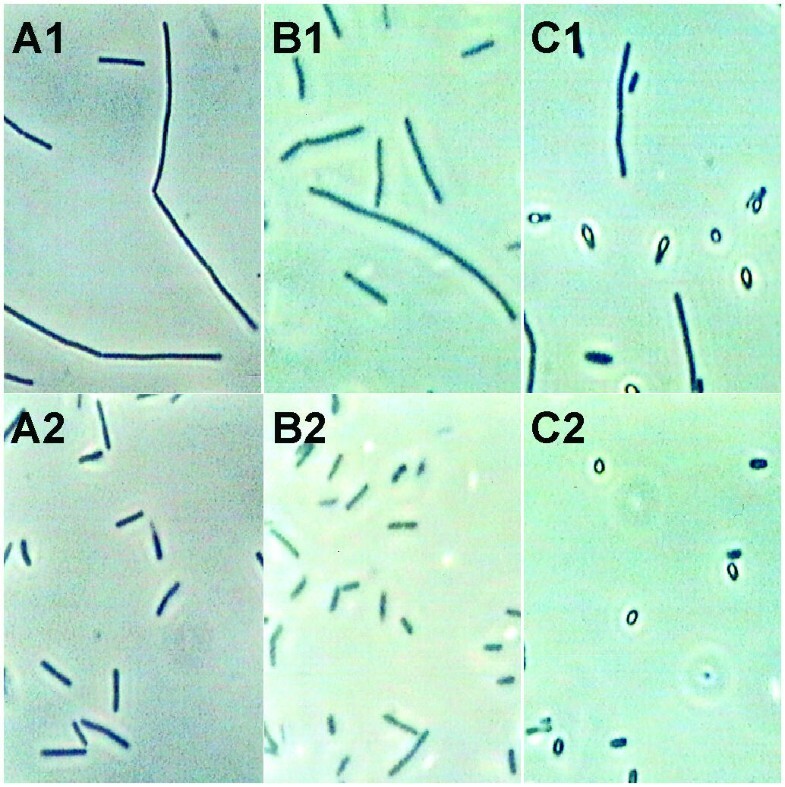 Cells were grown either in rich (A) or minimal medium (B). The ability of the cells to sporulate is shown in panel C. Magnification used was 400 ×. GluP minus cells (A) phenotype as shown by fluorescence microscopy, in comparison with the wild type cells (B). 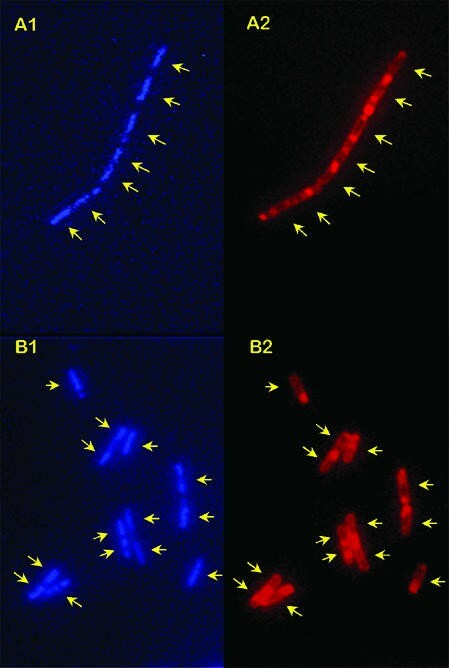 Chromosomal DNA (1) was stained with bisbenzimide (blue fluorescence). Septa and cell membrane (2) was stained with FM5-95 (red fluorescence). Arrows indicate single cell. Magnification used was 1000 ×. Since gluP is located within the glucokinase operon and the gene product, GluP, is predicted to be a transmembrane protein, we tested whether GluP plays a role in glucose uptake. We performed a time course study to observe the ability of GluP minus cells to take up [14C]-glucose. Several experimental controls were employed, such as the wild type cells (positive control), enzyme IIGlc (ptsG::cat) minus cells (negative control), and GluP (gluP::aphA3)-enzyme IIGlc minus cells (negative control) (Fig. 6). Enzyme IIGlc is a key molecule involved in PTS – dependent glucose uptake. The gene that encodes enzyme IIGlc, ptsG, is highly regulated by glucose . Consequently, cells were initially grown in medium containing 50 mM glucose, before adding the [14C]-glucose, in order to induce the production of enzyme IIGlc. Our experiment showed that the ability of GluP minus cells to take up [14C]-glucose was generally lower, i.e. ~20% at 120 s, than the wild type's (Fig. 6). Nevertheless, the increase of [14C]-glucose uptake for both wild type and GluP minus cells was positively correlated with time, although there was an expanding gap in their ability to take up [14C]-glucose (Fig. 6). In contrast, the uptake of [14C]-glucose by enzyme IIGlc minus cells was nearly abolished (Fig. 6). This suggests that both wild type and GluP minus cells rely on the presence of enzyme IIGlc to take up [14C]-glucose. Surprisingly, cells lacking both GluP and enzyme IIGlc were able to take up [14C]-glucose, although at a much lower [14C]-glucose concentration (i.e. ~80% at 120 s) than the wild type cells (Fig. 6). These mutant cells were importing glucose only at a limited [14C]-glucose concentration, i.e. ~50 µmol/mg protein, across the time points started at 30 s (Fig. 6). The phenomenon here may be due to the role of non-PTS dependent glucose uptake as suggested by Paulsen et al. (1998) . [14C]-glucose uptake by GluP minus cells was slightly lower than the wild type's. Cells were grown in LB contraining 50 mM glucose. The B. subtilis strains used are indicated. Standard deviation of two independent experiments is indicated. Once we had found out that GluP was affecting glucose uptake, we wondered whether GluP might contribute to glucose export. In order to understand this mechanism, we set up a more complex experiment involving multiple mutations in the PTS pathway and glucose metabolism. We added trehalose in all culture media, so that we could measure the glucose content in the growth medium if there was some export of cytoplasmic glucose. As we reported previously, trehalose was imported via enzyme IITre of the PTS and was phosphorylated into trehalose 6-phosphate [29–31] (Fig 7A). Phosphorylation of trehalose was subsequently followed by hydrolysis of trehalose 6-phosphate into glucose and glucose 6-phosphate [29–31]. The hydrolysis of trehalose 6-phosphate was catalyzed by a cytoplasmic phospho-α-1, 1-glucosidase (TreA) [29–31]. The glucose was then phosphorylated by glucokinase (GlcK) [8, 10]. Interestingly, we observed that there was some glucose detected in the growth medium . This glucose could be transported back into the cytoplasm and phosphorylated by ptsG-encoded enzyme IIGlc or via non-PTS' GlcP. A summary of the glucose metabolism and transport is depicted on the right panel of Fig. 7A. GluP contributes to glucose export. (A) A model of import-export of glucose by B. subtilis depicts the role of GluP as glucose exporter, as shown by right panel. Left panel indicates single or multiple eliminations (red or green cross) of proteins used in this study. Green crosses were part ptsGHI::erm mutation. (B) Glucose content in 50 mM trehalose supplemented LB medium of the wild type cells or various genotypes of B. subtilis. Standard deviation of two independent experiments is indicated. Cells were grown for six hours on trehalose supplemented medium, before we were able to detect a considerable amount of glucose in the growth media of wild type, GlcK (glcK::spc) minus, and enzyme IIGlc (ptsG::cat) minus cells (Fig. 7B). The latter mutant cells exported about the same amount of glucose as the wild type, suggesting a balance between phosphorylation of glucose and hydrolysis of trehalose 6-phosphate. The glucose content was even greater, i.e. ~7 mM, in the growth medium of cells lacking both GlcK and enzyme IIGlc (Fig. 7B). This was probably due to the accumulation of the glucose byproduct from trehalose 6-phosphate hydrolysis plus the recycling of glucose that was imported by GlcP (Fig. 7A, left panel). These observations hinted us to hypothesize that GluP probably carried out the export of glucose. This was likely to be the case, since the abrogation of GluP resulted in a very low amount of glucose in the growth medium of GluP minus cells (Fig. 7B). As a negative control, we used B. subtilis QB6020, which lacked enzyme IIGlc (encoded by ptsG), enzyme I (ptsI), and HPr (ptsH). Cells carrying the ptsGHI::erm mutation or PTS minus cells were unable to take up trehalose, and therefore their growth medium contained very little glucose (Fig. 7B). Cells carrying multiple mutations, i.e. glcK::spc-gluP::aphA3, ptsG::cat-gluP::aphA3, ptsGHI::erm-gluP::aphA3, glcK::spc-ptsGHI::erm, glcK::spc-ptsGHI::erm-gluP::aphA3, or glcK::spc-ptsG::cat-gluP::aphA3, had only very small amounts of glucose in their growth media (Fig. 7B). These results are strong evidence for the contribution of GluP in the export of glucose. It is possible that GluP may act as a glucose exporter. B. subtilis GluP is clearly an interesting molecule. Firstly, the protein consists of a putative rhomboid domain (probably located within transmembrane helices) and two C-terminus TPR motifs. Based on protein structure-function relationships, the rhomboid family may control many aspects of growth and development [32–35]. Rhomboids are thought to have evolved in bacteria and were later acquired by archaea and eukaryotes through several independent horizontal gene transfers . Subsequent evolution of the rhomboid family in eukaryotes took place through multiple duplications and functional diversification, i.e. by addition of extra transmembrane helices . It is intriguing that eukaryotic rhomboid protein, evolved from the bacterial membrane transporter, gained intracellular membrane protease properties. The first rhomboid family domain was actually identified in Drosophila melanogaster roughoid (Rho), and is involved in the epidermal growth factor (EGF)-dependent signaling pathways [18, 36, 37]. Inactivation of both Rho-1 and Rho-3 was lethal due to loss of the EGF receptor . The loss of EGFR caused the absence of MAP Kinase pathway, which led to failure in cell differentiation . In simpler organisms such as bacteria, the inactivation of rhomboid protein AarA of Providencia stuartii resulted in abnormal cell division . Here we also provide evidence that GluP minus cells were defective in their ability to separate during cell division, resulting in a filamentous phenotype on both rich and minimal medium (Fig. 4, Fig. 5). Therefore, it is thought that this phenotype may be related to the role of the rhomboid domain. On the other hand, the TPR motif was originally identified as a protein interaction module in yeast cell cycle proteins [38, 39]. However, TPR motifs have since been shown to occur in proteins with diverse functions mediating a variety of different protein-protein interactions . 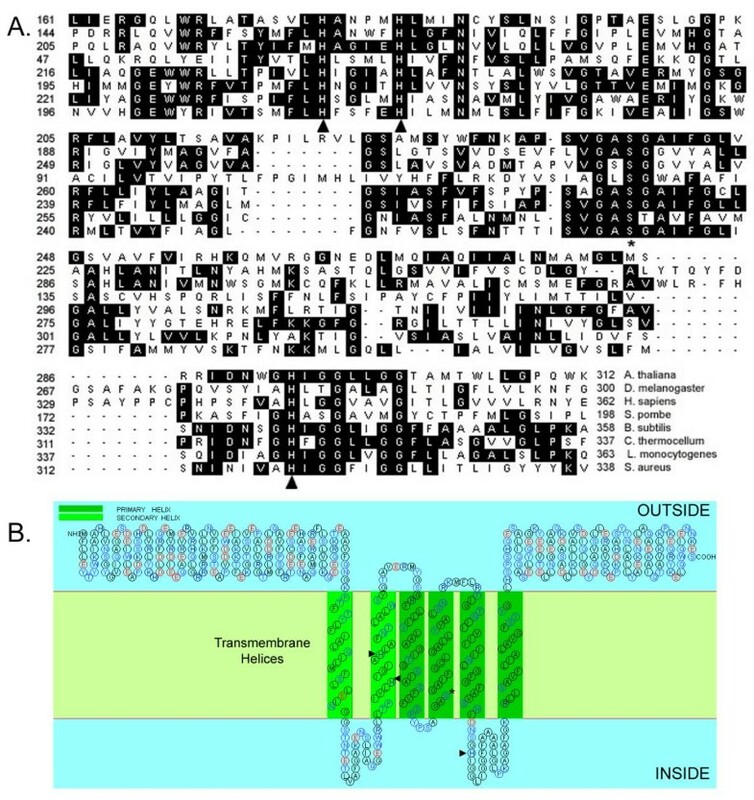 Four major complexes involving TPR proteins have been identified: (a) molecular chaperone complex, (b) anaphase promoting complex, (c) transcription repression complex, and (d) protein import complex . Based on this functional deduction, the C-terminus containing TPR motif of GluP may interact with other unknown proteins. As we have mentioned earlier, GluP is among the first combined rhomboid-TPR proteins reported. Interestingly, the seven other bacterial rhomboid-TPR proteins are restricted to Gram-positives. Although we have shown the possible function of GluP in glucose export, the implication of combined rhomboid domain and TPR motifs toward a protein function is still not understood. The second interesting aspect of GluP is its role in glucose transport, particularly as an exporter. We now know that at least two genes, gluP and glcK, within glucokinase operon contribute to glucose utilization. Whether GluP and GlcK are able to have direct interaction remains unclear. The balance of transport reactions involves the export of metabolic end products and the import of exogenous substrates . Glucose can re-enter the cell via the glucose PTS' enzyme IIGlc, which in turn triggers a regulatory cascade involving CcpA, HPr, and the HPr kinase leading to carbon catabolite repression . The glucose-transporting PTS, which is bacterial specific, plays important roles in transport (import), metabolism, and transcriptional regulation . Another method of re-importing glucose into the cytoplasm is via a non-PTS pathway, which involves GlcP (Fig. 7A). The expression of glcP may be induced by the presence of glucose 6-phosphate as a result of glucose phosphorylation either by enzyme IIGlc or GlcK [5, 7, 8]. However, the GlcP minus cells imported only about 30 % less glucose than the wild type . There was no obvious detectable effect on the glucose uptake between cells harboring the ptsGHI mutation and cells carrying double mutations in ptsGHI and glcP . This suggests that the major player in glucose uptake was the PTS rather than the non-PTS. Therefore it is not surprising that glucose was found in much higher concentrations in the growth medium of enzyme IIGlc-GlcK minus B. subtilis cells than in enzyme IIGlc minus, GlcK minus, or the wild type cells alone (Fig. 7B). Single or multiple mutations in the glucose metabolism and transport pathways provided strong evidence for the possible role of GluP in exporting glucose. Since GluP itself may acts as an exporter, we therefore, would like to propose GluP as a new member of the sugar transporter family. Our results confirmed that GluP is located within B. subtilis glucokinase operon and is putatively regulated by σA-dependent promoter. Together with two other genes within the operon, yqgQ and glcK, the transcription of gluP was prominent during the exponential growth phase (T-2) of B. subtilis. In the course of transition into stationary growth phase (T0 – T2), the transcription of gluP was down regulated. However, another putative transcription factor, σH, may bind its recognition site within gluP, and therefore, maintain the transcript levels of yqgQ and glcK during the transition growth phase (T0). Transcription of the glucokinase operon seems to be completely down regulated once the cells enter the stationary growth phase (T2). The importance of gluP expression during the exponential growth phase may be linked to the role of the product, GluP, in cell division. GluP may contain very interesting structural signatures: rhomboid domain and two TPR motifs. It would be intriguing to elucidate the role of these signatures in the bacterial cell cycle. Nevertheless, this is among the first reports of a protein with combined rhomboid-TPR signatures. Microscopic analysis showed that GluP minus cells were unable to divide normally and had lower sporulation frequencies than the wild type. GluP, which is likely located within the transmembrane helices, may be important for normal cell division. Another possible role of GluP is in glucose transport. We obtained evidence that the import of glucose was slightly reduced in the absence of GluP. However, whether this was due to incomplete cell division is yet to be confirmed. More striking evidence of GluP function was a direct correlation with glucose export. 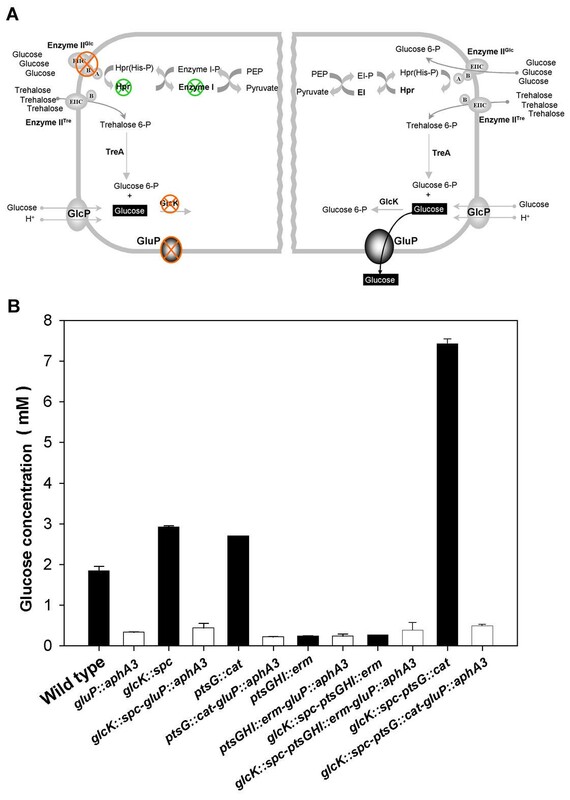 Cells lacking GluP were unable to export glucose. Therefore, GluP can be categorized as one of the glucose transporters. Our results also showed that gluP is the second gene within the glucokinase operon, besides glcK, which has a possible role in glucose utilization. Bacterial strains used in this work are listed in Table 1. B. subtilis and E. coli strains were grown at 37°C on LB medium (1% tryptone, 0.5% yeast extract, and 1% NaCl) and supplemented with antibiotics whenever required, e.g. 5 µg ml-1 chloramphenicol, 100 µg ml-1 ampicilin, 6 µg ml-1 phleomycin, 50 µg ml-1 spectinomycin, 25 µg ml-1 kanamycin, 1 µg ml-1 erythromycin, 25 µg ml-1 lincomycin or 10 µg ml-1 tetracycline. Minimal medium C  containing 50 µg ml-1 tryptophan, 11 µg ml-1 ferric citrate, 2 mM magnesium chloride, 1 mM calcium chloride, and 20 mM potassium glutamate was used. Sporulation was observed in NB medium (Oxoid, England, UK) which contained 0.1 % Lab-Lemco powder, 0.2 % yeast extract and 0.5 % NaCl. aBGSC, Bacillus Genetic Stock Center, Ohio State University, Columbus, Ohio btf> denotes transformation of linear plasmid DNA in indicated strain. Primers used to clone different glucokinase operon fragments for transcriptional lacZ fusions are listed in Table 2. We replaced glcK with lacZ. B. subtilis chromosomal DNA was used as a PCR template. The amplified DNA was digested with Eco RI and Bam HI and ligated into the corresponding cloning site of plasmid pAC6, which is flanked by partial amyE gene fragments . The resulting plasmid construct was linearized and then transformed into B. subtilis using the method as described by Kunst et al. (1994) . Chromosomal integration of the linearized plasmid containing gene fusion into amyE of B. subtilis was achieved by homologous recombination. Therefore, transformants selected on the appropriate antibiotic were tested for the loss of α-amylase activity on LB starch (1%) plates (Table 1). β-galactosidase activity was assayed qualitatively on LB plates containing 200 µg ml-1 of 5-bromo-4-chloro-3-indolyl-β-D-galactopyranoside (X-Gal). β-galactosidase activity was also determined as described by Miller (1972)  with modification as described by Msadek (1990) . This quantitative assay used o-nitrophenyl-β-D-galactopyranoside (ONPG) as a substrate. The enzyme activity is described as units per milligram total protein. Total RNA of B. subtilis 168 was isolated and purified using RNeasy total RNA kit (Qiagen, Hilden, Germany). The hybridization probe was obtained by amplifying a 449-bp DNA fragment of glcK, using plasmid pMD496 as DNA template. The following set of primers used was 5'-gctgcgctcggggaaatgtg and 5'-gatacgccgccgccaagaac. An 11 µg denatured total RNA sample was run in 1.3 % agarose-formaldehyde gel and was transferred to nylon membrane. The membrane was pre-hybridized for 2 h. Afterward, the membrane was incubated in hybridization solution containing denatured 32P-labeled DNA probe for 24 h at 42°C . The membrane was then washed once in washing buffer I for 15 min at RT, twice in washing buffer II for 45 min at 65°C, and finally in washing buffer III for 15 min at RT . Autoradiograph was captured on Phosphoimager BAS-1500 (Raytest, Straubenhardt, Germany), after exposing the membrane for 1 h on a film image plate BAS-IIIS (Fuji, Japan). Cloning of the complete gluP gene was only successful when a low copy number plasmid, pRK415, was used in E. coli. B. subtilis chromosomal DNA was used as a PCR amplification template. The primers used were 5'-cgcggatcgcgcggtttctgccgtcatgt and 5'-cggggtacctttcctcaccatttcttg. These primers recognized sequences between 235-bp upstream and 109-bp downstream of the gluP open reading frame. The amplified 1877-bp DNA fragment was then ligated into Bam HI and Kpn I sites of pRK415, resulting in plasmid pLR-YqgP . A suicide plasmid carrying gluP mutation (pLM-YqgP-Km1) was created by inserting a 1497-bp aphA3 cassette, obtained from Sma I-Stu I digestion of plasmid pDG792 , into the Bst 1107I site of gluP. Using the same set of primers and the pLM-YqgP-Km1 as template, a 3374-bp PCR fragment was then obtained. The orientation of the aphA3 cassette in direction with the gluP was determined by Eae I digestion resulting in 1244-bp and 2130-bp DNA fragments. B. subtilis 168 (BGSC, Ohio State University, Columbus, Ohio, US) was transformed with a linearized 3374-bp pLM-YqgP-Km1 to generate the strain MD229 carrying the gluP::aphA3. The GlcK and GluP minus strain MD230 was obtained by transformation of strain MD186  with the linearized pLM-YqgP-Km1. The enzyme IIGlc-GluP minus strain MD232 was obtained by transformation of strain MD153  with the pLM-YqgP-Km1. The enzyme IIGlc, GlcK, and GluP minus strain MD233 was obtained by transformation of strain MD191  with the pLM-YqgP-Km1. The enzyme IIGlc, enzyme I, HPr, GlcK, and GluP minus strain MD231 was obtained by transformation of strain MD189  with the pLM-YqgP-Km1. All GluP minus transformants were selected on LB medium containing 0.5 % glucose and 25 µg ml-1 kanamycin. The enzyme IIGlc, enzyme I, HPr, and GluP minus strain MD234 was obtained by transformation of strain MD229 with total chromosomal DNA of B. subtilis QB6020 . The MD234 was selected on LB medium containing 0.5 % glucose, 25 µg ml-1 kanamycin, 1 µg ml-1 erythromycin, and 25 µg ml-1 lincomycin. The validation of each transgenic B. subtilis strains was done by PCR analysis of the corresponding chromosomal DNA. Glucose concentration in the growth medium was determined using the Glucose (HK) Assay Reagent (Sigma, Deisenhofen, Germany) according to the manufacturer's suggestion . In brief, 10 µl of cell culture supernatant was mixed with 1.0 ml of the assay reagent and incubated for 5 min at 37°C. Glucose concentration in mM is equal to [(A340 Sample-A340 Blank)*2.93] (mg. ml-1) * 0.05555. B. subtilis strains 168, MD153, MD229, and MD232 were grown until an OD600 of 1.2 in LB medium supplemented with 50 mM glucose. A 25 ml cell culture was centrifuged. The pellet was then washed three times with ice-cold TM buffer (50 mM Tris-Cl and 20 mM MgCl2, pH 7.2). The cells were adjusted to an OD600 equal to 1.0. The uptake of [14C]-glucose by B. subtilis cells was assayed at 37°C. [14C]-glucose was added to a final concentration of 25 µM. 70 µl samples were taken at various time points (i.e. 0, 30, 45, 60, 120, and 240 seconds) filtered through cellulose nitrate filters (pore size: 0.45 µM), and washed three times with 5 ml TM buffer. Radioactivity of the wet filter was measured in a scintillation counter (Beckman, Fullerton, USA). Cell culture was prepared either by growing the cells at 37°C in LB or C minimal medium. A 25 µl sample of culture was added to the center of an object glass and then covered by a coverslip. Cells were monitored under a phase contrast microscope (Zeiss, Jena, Germany). Septum formation and chromosomal partitioning of B. subtilis wild type and the GluP minus strain MD229 were analyzed using the method described by Pogliano et al. . Membrane dye, FM5-95 (Molecular Probe, US) or chromosomal DNA dye, bisbenzimide (Sigma, Deisenhofen, Germany) was added with final concentration of 1 µg ml-1 and 0.1 µg ml-1 onto fixed B. subtilis cell, respectively. The fixed cells were bordered with Dako-pen (Dako, Glostrup, DK). The cells were then incubated for 15 min and were washed with PBS buffer thoroughly. The cells were then overlaid with mounting medium, elvanol (DuPont, Bad Homburg, Germany). Cells were observed under the Axiophot fluorescence microscope (Zeiss, Jena, Germany). The microscope was equipped with UV filter having an absorption wavelength of 360 nm and an emission wavelength of 461 nm to observe bisbenzimide staining cells. A Cy3 filter with an absorption wavelength of 514 nm and an emission wavelength of 566 nm or a rhodamine filter with an absorption wavelength of 550 nm and an emission wavelength of 573 nm was used for the observation of FM5-95 stained cells. Images were captured using CCD color video camera (Sony, Japan) and processed with AxioVision 2.0 program (Zeiss, Jena, Germany). Sporulation frequency was determined according to Bohin et al. . In short, cells were incubated on NB medium at 37°C with strong agitation. The cell growth was monitored with a spectrophotometer at 600 nm. End of the exponential growth was measured as time zero (T0). At T0 the viable cells (V0) were counted as cfu.ml-1. Twenty hours after T0 (T20), cells were harvested and heated for 10 min at 80°C. The number of spores per milliliter was then counted (S20). The value of S20/V0*100 was taken as the sporulation frequency. GluP sequence (GenBank BG11683), available from the B. subtilis genome project [11, 12], was used to predict the protein structure. The two-dimensional structure of the transmembrane helices and the entire GluP protein's structure was elucidated using the TMHMM (v2.0)  and SOSUI . The three-dimensional structure of the GluP TPR motif was constructed by Geno3D  using human PEX5 TPR motifs  as template. GluP related protein sequences from other organisms were retrieved from the GenBank database. These sequences were aligned using the MegAlign 4.0 program (DNAStar, Madison, USA). The multiple alignments were based on the Clustal method . This paper is dedicated to Dr. Michael K. Dahl, who passed away on May 4, 2003. We are grateful to U. Ehmann and S. Schoenert for their interest and help. We would like to thank B. Scott of the Faculty of Medicine, University of Ottawa, for critical reading of the manuscript. The experimental work was carried out in the laboratories of W. Hillen (University of Erlangen-Nuremberg) and W. Boos (University of Konstanz). LRM carried out all aspects of the work and drafted the manuscript. FMM contributed in the cytochemistry and supervised the writing of the manuscript. MKD was supported by DFG and Fonds der Chemischen Industrie and supervised the experimental studies.